This is one of the cutest contemporaries I’ve ever read. It was so much fun and had such a cute plot. I really loved the concept of this book and Jessie was a wonderful main character. She was really well written and I thought she had some really nice character development. The mystery of SN didn’t really drive me to finish the book as much as I thought it would have though and it took me a really long time to get through this book. 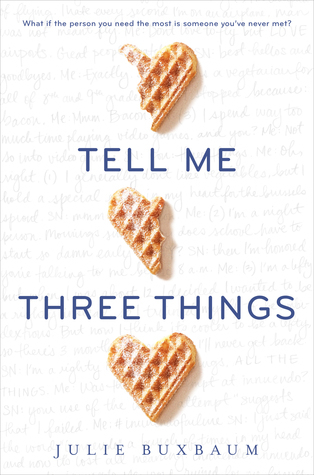 But once I had enough time to finish Tell Me Three Things in one sitting, I did. Even though this isn’t the most amazing contemporaries I’ve read, it sure is one of the cutest and I really enjoyed it.